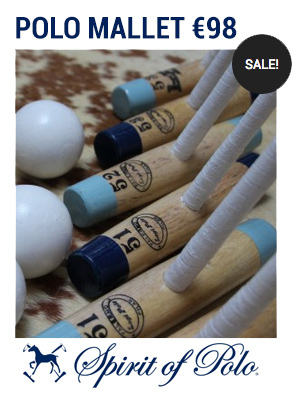 Let’s have a look at one of the first things you need to learn about polo: The line of the ball. 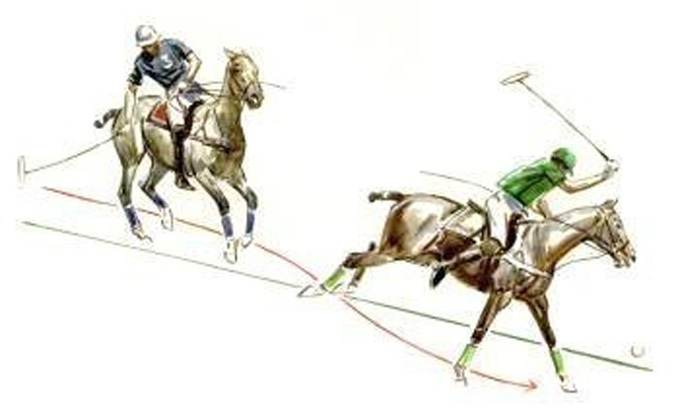 The line of the ball and the right of way are the most important rules in Polo. The line of the ball: when a player hits the ball, an imaginary line starts existing between the point where the player hit the ball and the destination of the ball. this is the line of the ball. It changes every time the ball changes direction. The right of way: A player has the right of way as long as he does not need to cross the line of the ball (between the player who hit the ball before and the destination of the ball) to hit the ball. As usual in Polo, those two rules were set for safety reasons. Indeed, if a horse crosses the way of another one in full gallop, the risks of injuries for both the horses and the players are very high. Most fouls and penalty shots are related to players improperly crossing the “Line of the Ball”. Riding alongside a player with the right of way is permitted, as long as his way is not hindered. A player can also cross the “Line of the Ball” when it does not create a dangerous situation. From these rules derivate also all the rules about changing directions and when hit straight or reverse.